Why Kasese river banks burst. 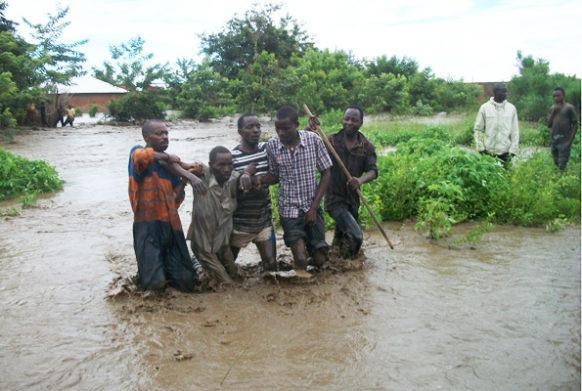 Home>>Posts>>Why Kasese river banks burst. River Nyamwamba has continued being hazardous to those residing in Kasese after it burst its banks again bringing along huge blocks of rocks which lead to sever destruction, loss of lives and property and has forced people out of their homes. 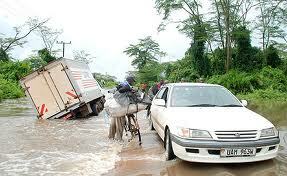 Transport has as well been affected as roads are blocked and bridges can’t be crossed. Buses and heavy trucks are forced to drop off passengers half way the journey forcing them to carry their heavy luggage on head or hire services of potters. This is bad news to the Uganda safari industry as tourists having their Uganda safaris and tours are either delayed or to reschedule their safaris. This catastrophe has so far left some people dead and thousands homeless. This river, which originates from the glaciers of Rwenzori Mountains, flows through Kilembe Mines with at least 15 kilometres downstream from Kilembe mines. River Rukoki, which is its main branch, flows into a wide stream of wetlands bordering the north shores of Lake George. Human settlement in the area which brings along cultivation on the slopes of mountain Rwenzori has been pin pointed for the sever degradation of Nyamwamba river valley which affects the drainage system as well as natural checks against floods. Researchers and scientists from Makerere University and the Technical University at Braunschweig in Germany have however come up and stated mining as the major cause of the has environmental damage. The 2005 Research findings indicated that for the previous 20 years, heavy rains falling in Kasese have washed copper pyrites down the slope and pouring into the waters of the River Nyamwamba and Lake George where there is high concentration of iron, copper, zinc and cadmium and have with time accumulated into the soil, water as well as into the plants. With such degradation there are fears of activities like fishing and tourism being endangered. The council however has revealed that there are no plans to stop these acts of degradation from the mines but has so far made attempted to evict squatters from the river’s valley. 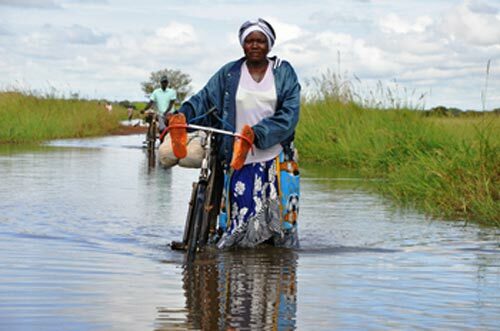 Previously, the district announced plans to evict people residing in the Kahokya Wetland of the Lake Katwe Sub-county but this exercise was resistance as some locals demanded compensation before them leaving their residences. However research shows that 48 % of the wetlands in the district have already faced encroachment and all this is blamed on the problem of land scarcity in the country. Never the less despite this disaster of the flooding in Kasese the Uganda government through the State Minister for Disaster Preparedness Musa Ecweru alongside a team from the Office of Prime Minister, Uganda Red Cross and district paid a visit to the affected area recently. Relief vehicles containing items such as tarpaulins, sauce pans, blankets and mosquito nets, arrived already and supplied various items to the affected people and several other deliveries were made including 100 bags of maize flour and 30 bags of beans aimed at aiding 400 families. The wrecked roads are yet to be repaired to allow travelers both local and those on their safari to Uganda find movement through those areas better.